E cell organized an activity on "how to pen down my plan"
E cell organized an activity on "how to pen down my plan" by Mr. Raja Singh (Venture, Adventurer, Founder of Crazy Ripples) on 9th September, 2016. Mr. Singh had great knowledge & experience of both success and failures of various business ideas. He explained his journey in brief, his family Business background, his experiences about working with ideas while pursuing his education in India and abroad. It was motivating to see someone young who has achieved such great heights of success. His idea about being independent and achieve things on his own was impeccable and was surely a great source of motivation for students because the examples and anecdotes were real life. The students had ideas on their minds but lacked the courage and motivation to express, to start which was a big hindrance. The workshop gave them the confidence in developing faith in their idea. Take the ideas in the right direction. He explained ways in which a good, profitable and worthy plan can be formed and implemented. 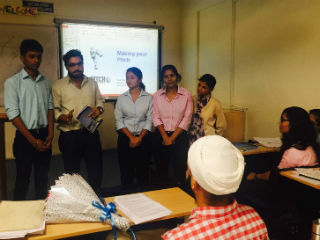 The students took part in an activity in which they formed different teams and were allotted start up plans. 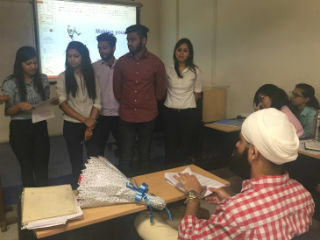 Within few minutes each group had to present different plans with different methods like personal story, x for y of product ideas, Pivot/ off shoot and many more .the younger lot has many innovative ideas and energy but lack resources and that consistency to work with determination over one single plan. The workshop was successful in bringing out that passion and courage to present to the fore the idea which was longing to come out.